Give the gift of money to your friends and family, $10 Gift Certificates. 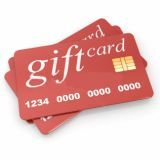 Give the gift of money to your friends and family, $150 Gift Certificates. Give the gift of money to your friends and family, $200 Gift Certificates. Give the gift of money to your friends and family, $75 Gift Certificates.